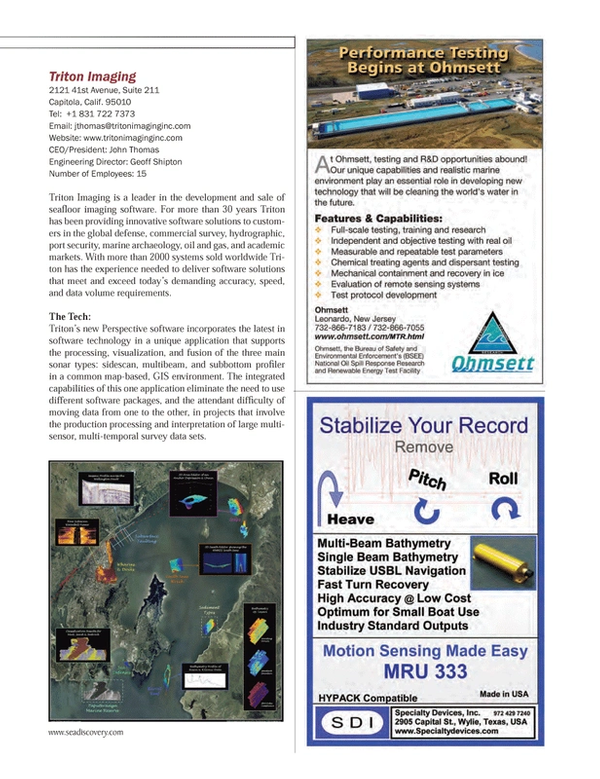 Triton Imaging is a leader in the development and sale of seafloor imaging software. For more than 30 years Triton has been providing innovative software solutions to customers in the global defense, commercial survey, hydrographic, port security, marine archaeology, oil and gas, and academic markets. With more than 2000 systems sold worldwide Triton has the experience needed to deliver software solutions that meet and exceed today’s demanding accuracy, speed, and data volume requirements. Triton’s new Perspective software incorporates the latest in software technology in a unique application that supports the processing, visualization, and fusion of the three main sonar types: sidescan, multibeam, and subbottom profiler in a common map-based, GIS environment. The integrated capabilities of this one application eliminate the need to use different software packages, and the attendant difficulty of moving data from one to the other, in projects that involve the production processing and interpretation of large multi-sensor, multi-temporal survey data sets.